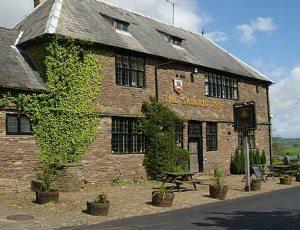 Skirrid Mountain Inn01873 890258work InnThe Skirrid Mountain Inn is situated in Llanvihangel Crucorney; a small village just off the A465; approximately 5 miles north from the centre of Abergavenny and 18 miles from Hereford. It is reputed to be the oldest Public House in Wales and it's history can be traced back as far as the Norman Conquest & has recently been voted the 'most haunted' in the UK. The Skirrid Mountain Inn is situated in Llanvihangel Crucorney; a small village just off the A465; approximately 5 miles north from the centre of Abergavenny and 18 miles from Hereford. The inn has an ancient wood-paneled restaurant where you can sit and enjoy delicious home cooked food from the menu. There are fireplaces with real fires, two bars, one with a pool table, an old ship's bell for calling last orders, and three comfortable luxury visitor's bedrooms, two with four poster beds.